Nissequogue Club was founded by a small group of investors in 1966 on over 120 acres of land previously owned by William J. Ryan. Mr. Ryan was the owner and publisher of “Literary Digest” a widely read and highly respected magazine in the 1930’s and 40’s. The present clubhouse was originally constructed in 1929 as the main house of the Ryan estate. Nissequogue is a small village on Long Island. The setting of the Nissequogue Golf Club is reminiscent of an old grand estate- ideal for the elegant style of this couple. Best spots for photos in this venue is the main entrance as featured here, the grand staircase, and the spectacular rolling hills of the golf course. Of course, you may not venture out on the immaculately groomed grass unless you are playing, but there are plenty of paths that will work just fine. 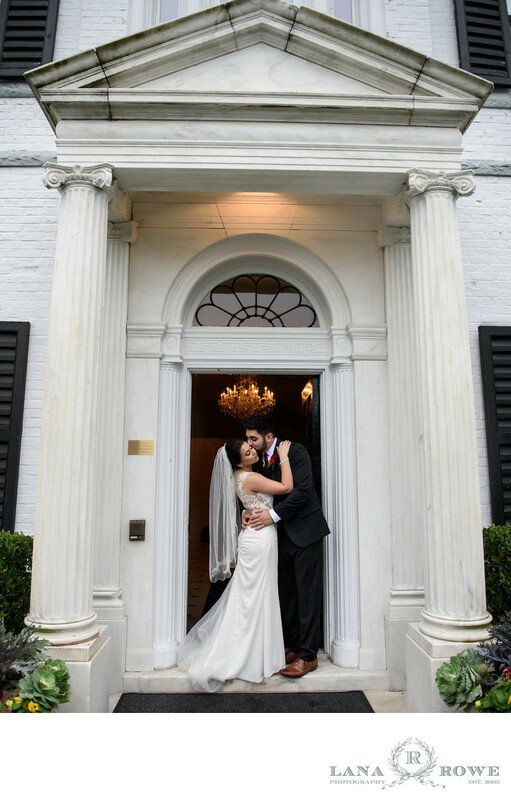 This stately mansion offers the perfect setting for an intimate wedding reception. Nissequogue Golf Club in Saint James, NY is a private club hosting exclusive events in a scenic setting overlooking the Saint James Bay. Location: Nissequogue Golf Club, 21 Golf Club Rd, St James, NY 11780.